First version of MGConfigurationManager is released! 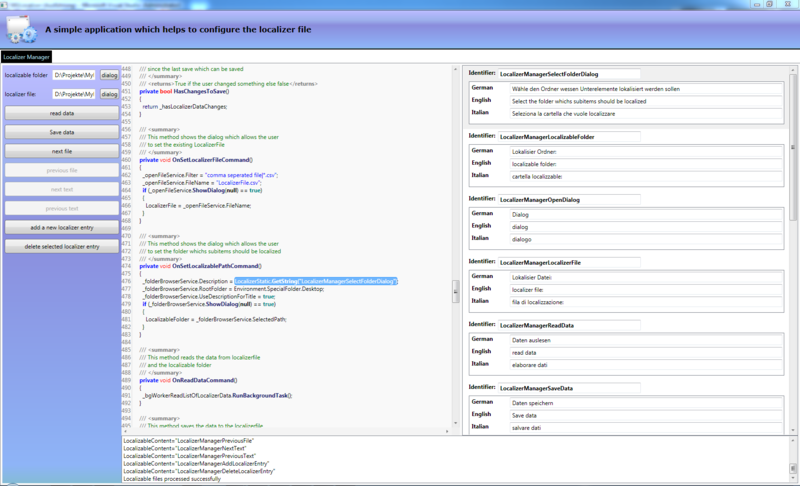 today I managed it to release the first version of the MGConfigurationManager. It is a simple application which helps you to localize you program (if you are using the MGLocalizer). since I am usually working with WPF I decided to create my own localizer. Because I don’t like the standard way to localize a WPF application. I will release the ConfigurationManager soon. This program automatically generates the csv file for the localizable strings in the .cs file which are located in the given folder. Such that you don’t have to do it by hand. Please visit the MGLocalizer – Project page to get more information about the project.